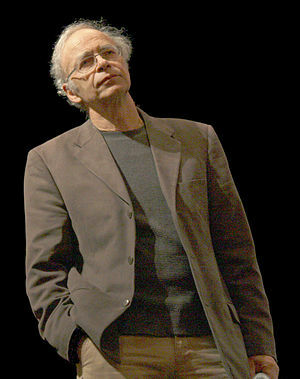 Peter Singer in his provocative book The Life You Can Change raises the phenomena of a gentle nudge to slowly help shift community trends to overcome apathy. He mentions this in relation to a culture of giving. Singer argues that even when we are choosing in our own interests, we often choose unwisely. So his writing here is about informing better decision making. If major corporations, universities and other employers were to deduct 1% of each employee’s salary and donate the money to organisations fighting global poverty, unless the employee opted out of the scheme, that would nudge employees to be more generous and yield billions more for combatting poverty. He writes that while the idea might sound odd now, but if a few corporations or institutions adopt it, it could spread. Is this part of the solution? More money? If so, how should it be distributed and spent? What other changes might be introduced through giving it a bit of a nudge over time? This entry was posted in Fundraising, Nudge, Peter Singer and tagged Decision making, Peter Singer, Poverty. ‘Fun Run’- Oxymoron? Go on, come and run 2.4 km for the global launch! Exactly Catherine! Fred Chaney once told me that there are very few original thinkers and revolutionary ideas. More likely and most helpful is to find your fellow nudgers and work together incrementally to make a difference. Wouldn’t taking the decision-making responsibility of how much to give and who to through an enforced payroll deduction help to perpetuate apathy rather than overcoming it? If the argument is that we choose unwisely by ourselves, I’m even more nervous about putting that responsibility in the hands of my employer. The question for me is how to encourage individuals to make informed decisions and give of their own volition. Where is it that philanthropy steps in and plays a role in tackling poverty that corporate or government support can’t effectively fulfill? I tend to agree Antonia- I see this as one of the weaknesses in Singer’s book- he argues a position of greater giving, but without much substance behind that might be spent exactly. He makes a few sums based on the assumption of additional giving through the likes of this sort of example, and draws a comparison with the work of Jeffrey Sachs. To give some balance to the perspective from Singer I recommend Dmbisa Moyo’s “Dead Aid” (2009), as well as Paul Polak’s “Out of Poverty” (2008). I don’t claim to be any sort of expert, and for me this is as much as a journey of learning as it is about an experiential process of inquiry. I think the questions that are raised are really important. Singer points to the fallibility of self-interest. Like you argue, how is it that the employer is necessarily better informed than you to make a decision. There are some issues of scale, but I think the use of agency has become more of a brand-based commodity. This is an issue I want to tease out more over the coming 9 or 10 weeks, and being challenged by questions is fully welcome! I must admit that I haven’t read Singer’s book – I should get reading! Thanks for the other recommendations too. I suppose the ultimate challenge is not so much how to get people to give money, but how to get them to care enough to even consider giving in the first place. What is it that motivates people to understand and act on issues of global poverty – and to believe that change is possible ? A question which, I think, is at the core of what you’re doing with the run. It is going to be interesting to see how people react to what you’re doing over the coming weeks. I’m intrigued. Good luck with stimulating some informed discussion and learnings! Thanks Antonia- that is where I am headed- it is not about the money essentially. Clearly that is part of the solution, but if it was the solution there has been enough invested to make change already. I actually think it comes down to ‘political will’. I don’t mean a sharper focus within the UN or G20. I actually am talking about our own actions. Where do we place our priorities and what will we not accept to change how things get done? There has been a lot written about consumer advocacy for example- in some respects, I would place that in the same bag as CSR- well meaning initiative with a narrative around change, but ultimately in themselves they fail to be levels of change. There is a need for greater participation, on both incremental and radical interventions. And not just by the ‘big brand’ not-for-profit. Brand and trust become confused concepts- agency starts to trade on a currency of brand because of high level of trust- the brand becomes important and so meaningful systemic change suffers for the sake of maintaining that brand. Some people won’t like that message…. Maybe I should blog that right now!